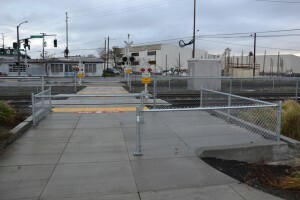 This week, final installation of safety enhancements began at the MAX Orange Line crossings at SE 11th Ave. Crews have just installed manual swing gates on the south side of the 11th Ave rail crossings, which means that bicyclists and pedestrians will need to open the manual swing gate before or after crossing the south tracks. 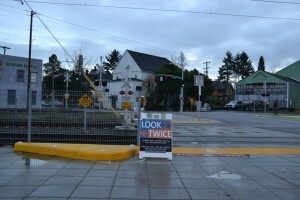 Additional signage on the gates and fencing at SE 12th will be installed over the next few weeks. 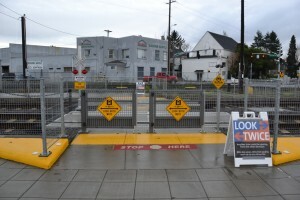 The swing gates, along with other additional safety changes installed between SE 8th and 12th avenues, improve the safety of bikes and pedestrians. 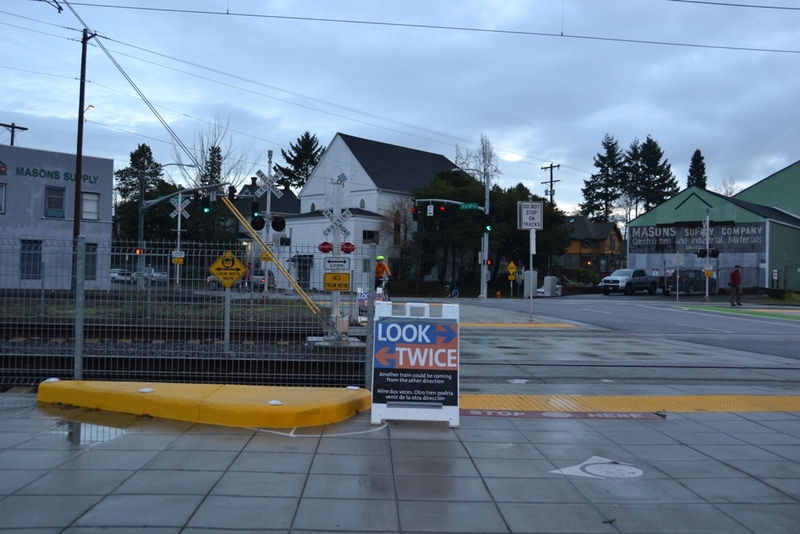 The changes help encourage people to heed signals, be more aware of approaching trains and to look both ways before crossing MAX tracks. The work is a collaboration between TriMet and the Portland Bureau of Transportation (PBOT). Concrete curb added to SE 12th Ave.
TriMet and PBOT will continue to monitor and evaluate crossing behaviors at these inner Southeast crossings. • Yellow paint will be added in several areas along the new multi-use path in order to improve visibility, including corners of curbs where bicycle turning movements take place and on curb in front of bollards at SE Caruthers cul-de-sac. All bollards have been modified to increase visibility. • The yellow line delineating “lanes” for people heading eastbound and westbound will be extended around the corner from SE 7th Ave to Caruthers St.
• At the junction of the Willamette Greenway and the path connecting to SE 2nd Pl immediately north of Tilikum Crossing, Bridge of the People, pavement markings will be added to encourage people riding downhill to slow down where paths merge. Additionally, both TriMet and PBOT are working with Union Pacific Railroad to adjust heavy rail signal timing to shorten the time people are stopped at the crossings. With safety enhancements completed, the Portland-Milwaukie Light Rail Transit Project Safety Ambassador program will end. 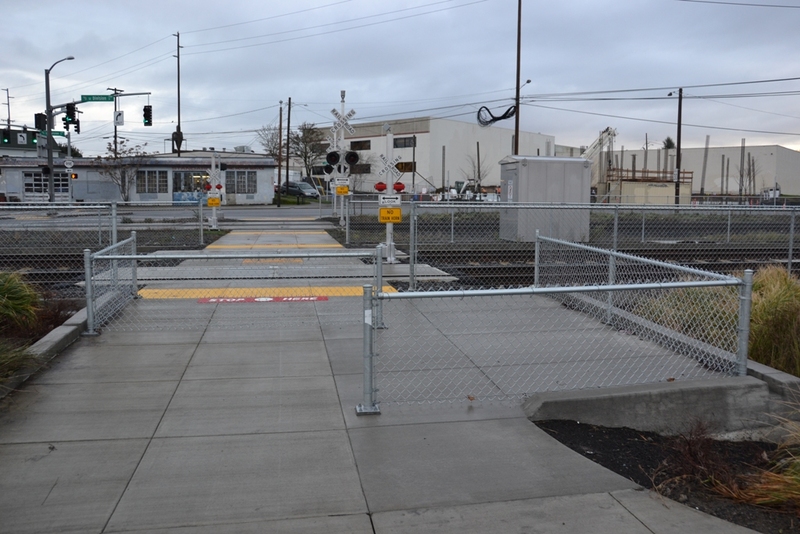 The program was put in place about nine months ago to inform the public of safe behavior along the new MAX line as rail operator training took place and the line began service.